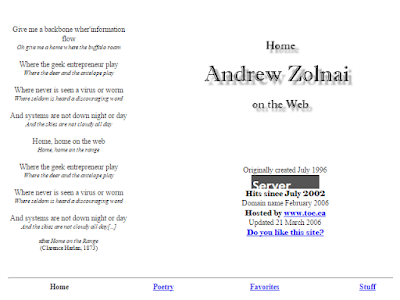 ...... Andrew Zolnai Blog: Twenty years... and five generations on the web! Note that was Generation 1, Gen-zero was a decade prior before Berners-Lee even coined the term web: it was called Hypertext then and had a static ip accessible on the Calgary optical fibre network. 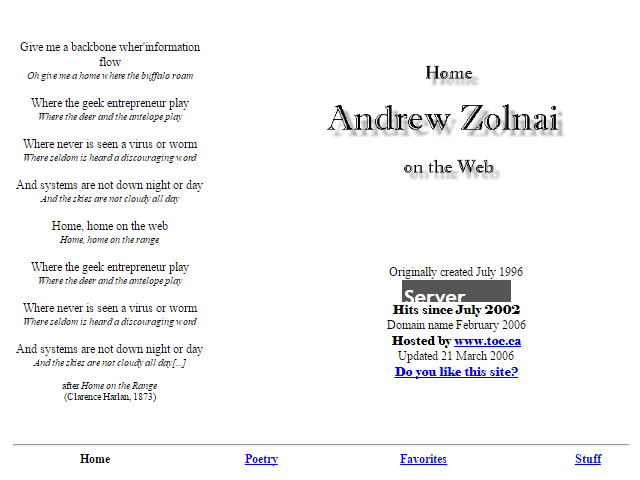 Note similar HTML and hypertext menus along the bottom. Gen-2 was the current zolnai.ca website my business storefront, and Gen-3 is this blog page on web mapping topics with its companion for longer posts. This blog top and side banners show all outlets. And Gen-4 is about.me the bottom banner linked in twitter etc.